With our resale villas in Torrevieja - Costa Blanca, the client can live in a spacious and cozy home with the rest of his family. A home that will allow you to discover all the advantages of living in a beautiful city, such as Torrevieja - Costa Blanca. A home that allows you to enjoy an ideal climate 365 days a year. In short, a property by and for you. 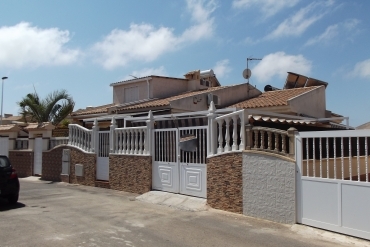 Our second-hand villas in Torrevieja - Costa Blanca are available in different styles so that the tastes or priorities of the clients can be satisfied. In this way, the client will be able to obtain the satisfaction he expected when contacting our agency, and our real estate company will be grateful that the client has placed his trust in us. Our agency has a large variety of resale villas in Torrevieja - Costa Blanca, among which there is an incredible property. This villa has a beautiful and spacious garden and a spacious independent kitchen. 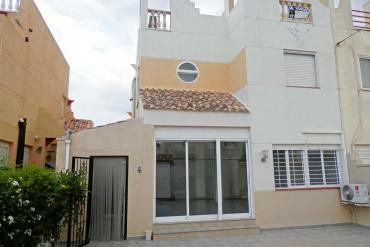 The villa is located in a quiet area, bordering Castilla La Mancha and the Valencia Community. The house has 4 bedrooms and 2 bathrooms. It is built on a total of 225m2 useful, on a plot of 13,000 m2. The house is oriented to the east and is located a few kilometres from the coast. To take care of the parking, the villa offers parking areas for vehicles. If you would like to be able to live in a property that offers wonderful views, this second-hand villa has fabulous natural landscapes. Our real estate agency has two great offices so you can access more detailed information of our resale villas in Torrevieja - Costa Blanca. On the one hand, if you want to meet our real estate agents from Torrevieja (Alicante), you can move to Centro Comercial Calle Bizet Local 6 La Siesta - 03184. There you can ask all the questions that you suggest. If you also want to call us by phone because you can not wait to visit us, you can call us at 0034 966 785 202 or 0034 669 366 996. Finally, our email is also available for any other suggestions. Sendusan email to info@casasespania.com. On the other hand, if you want to do the same but in our office located at La Zenia Golf 4B Orihuela Costa (Alicante), you can visit us, call us at 0034 965 083 434 | 0034 678 756 648 | 00441144630003, or send us an email to the same email.